The Candle and Matt Talbot Community Trusts were founded by Sr Caoimhín Ní Uallacháin OP, Dominican Sister, to establish a safe and welcoming environment for young men in Ballyfermot. Sr Caoimhín has committed her life to helping the poor and under privileged in Ballyfermot and has always believed that all of us are equally deserving of respect and dignity. At the heart of her work, has been her Christian faith. 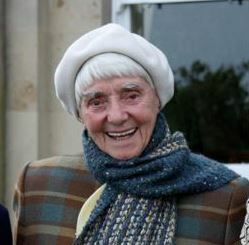 Originally a teacher in St Dominic’s Secondary School in Ballyfermot, she responded to a call for help from two young in Ballyfermot in 1976 which led her to establishing centres to provide some of Ballyfermot’s youth with hope and opportunity so that all young people would have the experience of the fullness of life. Sr Caoimhín has been associated with Ballyfermot for nearly four decades and retired from the Matt Talbot Community Trust in 2009. Candle Community Trust was set up by Sr Caoimhín and a small group of volunteers and supporters in 1978 to provide disadvantaged young men in Ballyfermot with greater opportunities. Candle originally began in an upstairs room of a shop in Ballyfermot and later moved to the church grounds. It was originally established as a day centre to educate young men in the skills of arts, crafts and other aspects of development. The centre received funding from local people and was constructed in 1981. Within a year, the numbers at the centre had grown dramatically and a year later Anco combined with Candle to operate a work training project, making garden, house and school furniture. Today, the centre continues to assist young people in the local community, providing training and necessary development services for up to 80 young people on a daily basis. From visiting homes and prisons and from being called on by the local community in Ballyfermot, Sr Caoimhín recognised that young adults continued to require ongoing support and assistance. The Matt Talbot Community Trust was established in 1989 by volunteers and supporters. The Trust centred on meeting the needs of the individual by befriending and supporting those in a Christian environment who may have spent time in prison or who had been affected by drug addiction and alcoholism. Originally, those in the Centre learned about gardening and cooking and were also given the opportunity to continue formal education. Later Sr Caoimhín managed with support to purchase a property at Ballinascorney in the Dublin Mountains, providing a haven for gardening and for families to holiday in. It was officially named St Martin’s Community Centre in 2002. Today, the Matt Talbot Community Trust continues its invaluable work, providing vital supports in health, education and skills to assist individuals with playing a greater role in the wider community.